Greg Doolan tribute page . Performance Dates for Rob Rosenlund. 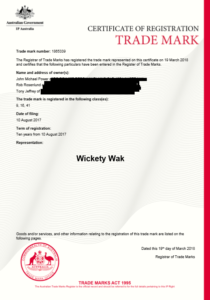 Entities that wish to use any material from this website or from the library of work attained by Wickety Wak ® from their 40 year period 1975 – 2015 must contact us in writing for such permission at info@wicketywak.com.au. Trademark is governed by the legal standing rights and laws under the trademark act (1995) which protects our body of work.